Northwestern walked away from its exhibition contest Friday night against Illinois-Springfield with a predictable double-digit victory. Freshman guard Isiah Brown led the way with 18 points as the Wildcats topped the Prairie Stars 89-52. With nonexistent stakes and a decided outcome from the opening tip, the game offered plenty of opportunities for coach Chris Collins to experiment with different lineups. The sophomore center looked good when in, scoring 12 points on 5-of-5 shooting and adding four rebounds and three blocks. But he also left the game in the second half limping and holding his leg after heading into the tunnel earlier. According to Collins, Pardon had taken a knee to the thigh and was tightening but was ultimately fine. He and freshman Barret Benson — who played surprisingly sparingly in the exhibition — constitute the team’s extremely thin center tandem and an injury to either would be costly. Last season, playing time for the then-sophomores was largely dictated by team need. When the offense needed energy or an athlete on the perimeter, it subbed accordingly. This year, it appears as though the Cats intend to lean on the third year duo in a broader sense. Lindsey started the exhibition and finished with 13 points, going 2-of-3 from deep. Skelly saw plenty of action, playing both the 5 in NU’s small ball set and the 4 alongside another big. He ran the floor nicely and spaced the floor well, despite scoring only six points. The freshman’s trademark scoring ability was on full display. Brown shot the ball well from deep and attacked the basket with confidence. Perhaps his best play of the day came in transition when Brown maneuvered through defenders and finished an acrobatic layup. He’ll be leaned on as a shot-creator in the same vein as Tre Demps and appears to have a substantial role within the offense. If he can continue to score efficiently and in loads against higher-caliber opponents, Brown has the potential to be one of the offense’s most dynamic players. Benson looked very raw in the limited action he saw. It’s expected — he is, of course, a freshman — but will need to develop better instincts given the role he is expected to assume. Vic Law (11 points) struggled out of the gate but found a rhythm late. After missing a chain of three-pointers, he finished the game connecting on a pair, hitting a jumper in between. Jordan Ash looks doomed to the bench yet again. Brown figures to run the offense when Bryant McIntosh sits. As for McIntosh, the newly-named captain struggled from beyond the arc, going 0-of-3 and scoring 11. The exhibition offered little evidence that the point guard took the next step, but it’s far too early to worry. Football writers Max Gelman, Bobby Pillote and Max Schuman discuss Northwestern’s offensive outburst against Michigan State, the secondary’s struggles and this Saturday’s matchup against Indiana. When Northwestern last traveled to East Lansing, Michigan — Nov. 17, 2012 — the Wildcats encountered a Michigan State team struggling due to poor play at the quarterback position. Despite touting future NFL star Le’Veon Bell at running back, the Spartans were hampered by quarterback Andrew Maxwell, who completed just 22-of-46 passes for two touchdowns and two interceptions that day as NU emerged with a 23-20 victory. Two games later, Michigan State made the bold decision to switch to backup Connor Cook midway through their bowl game. They rallied to beat TCU and then rode Cook to a 13-1 record the following season, including a 30-6 romp over the Cats in Evanston — the two teams’ most recent overall meeting. Now, with NU returning to East Lansing Saturday, the Spartans (2-3, 0-2 Big Ten) find themselves in a similar situation to 2012. The defending conference champions have lost three consecutive games for the first time since 2009: a 30-6 loss to No. 8 Wisconsin, a 24-21 overtime loss at Indiana and then a demoralizing 31-14 defeat at home against BYU last week. Quarterback Tyler O’Connor has faltered recently, and coach Mark Dantonio has hinted about upcoming personnel changes. All of that in mind, the Cats will seek to exploit a historically strong program that finds itself at its weakest point in years. Michigan State’s biggest strengths: In the standard Big Ten mold, Michigan State is effective running the ball and stingy against the run. The Spartans have allowed just 3.6 yards per carry this season, good for 32nd in the nation — nothing new for a team that has finished each of the past five seasons ranked in the top 25 in the category. They’ve managed only 16 tackles for loss this season, excluding sacks, but have also surrendered few lengthy runs, keeping opponent running backs consistently near the line of scrimmage. On the offensive side of the ball, running back L.J. Scott proved a reliable, smashmouth runner during his 2015 freshman campaign, which he finished with a career-high 22 carries in the Big Ten Championship Game. Gerald Holmes also had his share of big performances, including a 117-yard explosion against Nebraska. This fall, Scott racked up 203 total yards in Michigan State’s season-opening wins against Furman and Notre Dame combined, but he has struggled since and was out-touched 15-3 by Holmes against BYU. The Spartans will likely hit NU with a steady dose of the two runners. Michigan State’s biggest weakness: Michigan State’s vaunted defensive line, featuring projected first-round pick Malik McDowell, has produced a mere five sacks in five games (the Cats, by comparison, have 12) — and zero in the last two games. BYU quarterback Taysom Hill not only avoided sacks but also scrambled for 47 yards and a touchdown. Third downs have been an issue on both sides of the ball, as well. Indiana and BYU were both above 50 percent on third-down conversion rate against the Spartans’ defense — 9-for-16 and 10-for-16, respectively. Meanwhile, Michigan State has converted only 33 percent of its own third down situations in the last three games; that would rank 112th in the country on its own and has dropped the team’s season average (38.6 percent) to 73rd. Michigan State’s biggest question mark: The team’s quarterback controversy has dominated storylines in East Lansing over the past several days. Fifth-year senior Tyler O’Connor first showed cracks against Wisconsin, completing only 18-of-38 passes for zero touchdowns and three interceptions, and then was benched in favor of junior Damion Terry during the BYU loss. Freshman and former highly-touted recruit Brian Lewerke — who has only four career pass attempts — is also in the mix. Dantonio has avoided commenting on the situation and no starter has yet been announced for this coming weekend. Inexperienced NU cornerbacks Trae Williams and Alonzo Mayo could have an easier-than-usual matchup against whichever signal caller they face. Northwestern will hit the road on Saturday for the first time this season against an Iowa team that hammered the Wildcats (1-3, 0-1 Big Ten) each of the last two meetings. 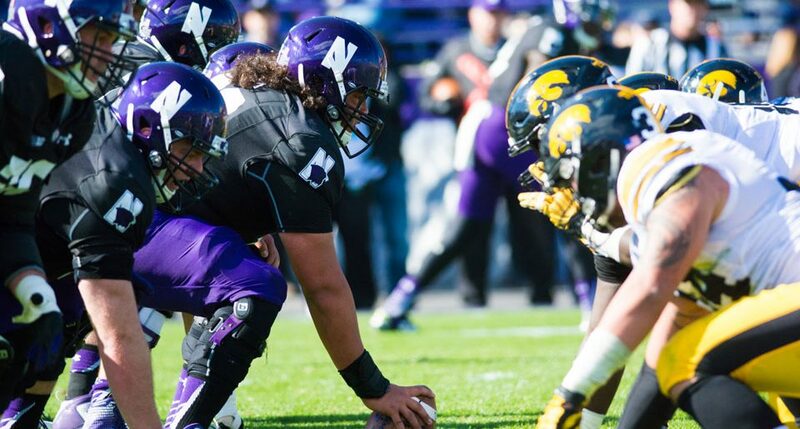 The Hawkeyes throttled NU 48-7 in Iowa City in 2014 before spoiling Evanston’s 2015 homecoming with a 40-10 win last year en route to an undefeated regular season. Iowa (3-1, 1-0) has shown more signs of weakness this fall, however, falling to FCS powerhouse North Dakota State 23-21 two weeks ago — the Hawkeyes’ first home loss since November 2014 — before narrowly edging Big Ten bottom-dweller Rutgers 14-7 last week. The running game on both sides of the ball generally tends to determine the course of Iowa’s games, and this week’s matchup against the Cats — despite offensive coordinator Mick McCall’s newfound affinity for passing plays — is likely to be more of the game. Iowa’s biggest strength: Iowa running back Akrum Wadley always comes to play against Northwestern. Wadley rumbled for 106 yards and a touchdown in his first 15 career touches against NU in 2014, then replaced star rusher Jordan Canzeri, who was injured early on in the 2015 meeting, and ripped off 26 carries for 204 yards and four touchdowns. Wadley is still working in a time-share with fellow running back LeShun Daniels this season — Daniels has 52 carries to Wadley’s 37 to date — but Wadley is more involved in the passing game, has been more efficient with his touches (7.4 vs. 5.8 yards per carry) and was the team’s leading rusher on Saturday against Rutgers. If history is any indication, the junior from New Jersey could pose a massive threat to the Cats this weekend. Iowa’s biggest weakness: The rushing defense has struggled almost as much as the rushing offense has excelled for the Hawkeyes. North Dakota State relied almost exclusively on the run in their upset win, rushing 49 times to 19 pass attempts and racking up 239 yards on the ground, before Rutgers pounded out an additional 193 yards on the ground the following week. Iowa now ranks 86th in the nation in rush defense. The onus to fix those problems falls most squarely on star linebacker Josey Jewell, whose tackling production has stayed about even with last year, and defensive end Parker Hesse, who has been very quiet. 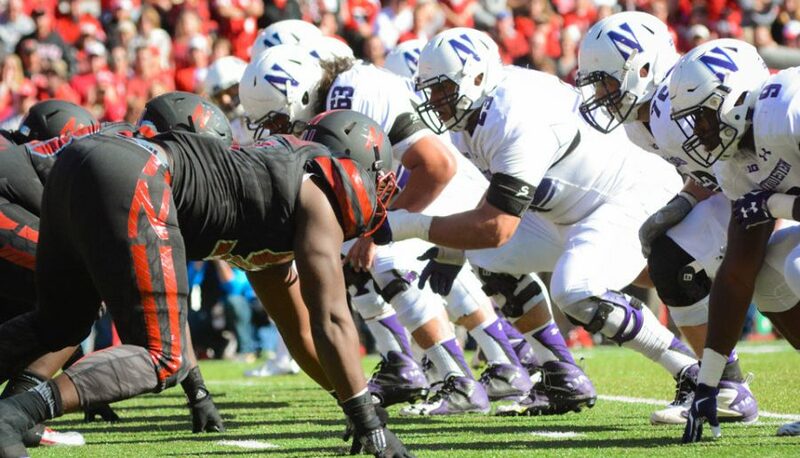 Keeping Jewell and Hesse blocked consistently will be crucial for NU. Biggest question: Which team will have more success on critical third downs? Neither the Cats nor the Hawkeyes have done well in third-down situations this season: Iowa ranks 83rd with a 37.2 percent efficiency rate, while NU is just behind in 89th at 36.1 percent. The two foes’ similar struggles in that regard have led, as would be expected, to issues in controlling the ball: both teams have recorded over 30 minutes of possession just once in four games each. Whichever offense can keep drives moving and control the clock seems likely to prevail come Saturday. Underneath the American flag and flag with the club’s logo, a purple-and-white Northwestern “N” flew over North Shore Country Club in Glenview, Illinois as the 20th annual Windon Memorial Classic began Sunday. After completing two rounds on the first day of action, the Wildcats are in fourth place with a score of 2-over as a team and are lead by junior Dylan Wu, who finished the day tied for fifth, shooting 3-under in 36 holes. The course at the North Shore Country Club hosted one U.S. Open in 1933, as well as the Western Open and the U.S. Amateur twice. The tournament, which is free and open to the public, had an informal feel to it. There were no rope lines, meaning spectators were free to get close to the action — as long as they watch out for any stray balls. With sunny skies and temperatures in the 70s and 80s for much of the day, numerous purple-clad spectators came out to the course. Players are responsible for carrying their own bags and report their scores to volunteers every three holes. The only people responsible for enforcing the rules are a few rules officials roving in golf carts spread over the 7,103 yard course. On the manicured course, the primary sounds are of the thwack of drivers hitting golf balls, the slightly quieter sound of iron shots and the faint roar of occasional airplanes flying overhead. The players are primarily competing against the course and not each other, meaning there is little antagonism shown to the other competitors in the three-person pairings. When Purdue’s Austin Eoff sunk a long iron shot for a birdie on the 10th hole of the first round, junior Dylan Wu acknowledged, “that was a sick shot.” Graduate transfer Conor Richardson was oddly paired with his former roommate from Florida, and the two were chatting throughout the round. But just because the players are not in direct competition with one another does not mean passions could not be inflamed, as many players became visibly frustrated after bad shots or near misses. With one round remaining in the tournament, those feelings could be magnified tomorrow. The third and final round of the tournament begins Monday morning. Each week, two Daily writers will debate the upcoming football matchup. One will take a glass half-full view and the other glass half-empty. Here is the Half-N-Half for Northwestern’s contest against the Nebraska Cornhuskers. 1. Will Justin Jackson run for more than 100 yards? Max Gelman (half-full): Jackson has an excellent chance to break the century mark against the Cornhuskers. Though he only tallied 40 rushing yards at Nebraska last season, Jackson is still the elite running back we all know him to be. Last week against the Blue Devils, Jackson had nearly 70 rushing yards in the first quarter as the Wildcats opened the game with a near-perfect drive. That has been a common theme for NU throughout the first three games — good opening drives and then a faltering offense. I don’t believe the offensive line troubles will last the whole season and if the line improves, which should be the case going forward, then Jackson should reach 100 again this week. Tim Balk (half-empty): With the exception of a three-game lull in the middle of the season, Justin Jackson was almost a lock to hit triple digit rushing yards each week in 2015. Through three games this year, those days seem to be over. Jackson missed the mark for the second straight week against Duke in Week 3, as offensive line problems continued to dog NU. With those problems unresolved, and the Cats’ offense forced to lean pass-heavy, it’s hard to imagine Jackson putting up big numbers against Nebraska, particularly in light of the fact that the Cornhusker defense was one of three — along with Michigan and Iowa — that managed to shut down “The Ball Carrier” during his mid-season slump last fall. Against a quality defense that will gameplan for the run, it’s unlikely Jackson will be a major factor. 2. Will the Cats out-possess Nebraska? Balk (half-empty): This one is easy. Nebraska has out-possessed all three of its opponents. NU has been out-possessed by two of its three. Nebraska managed to chew up clock against Oregon. The Wildcats’ offense struggled to stay on the field against an FCS team. You get the picture. NU can beat Nebraska even without controlling possession if the defense bends more than it breaks, and the big offensive plays that materialized against Duke keep on coming. But, more than likely, Nebraska’s multidimensional offense will spend a majority of the night on the field. Gelman (half-full): In order for NU to beat the Cornhuskers, it will need to sustain lengthy drives and keep the defense on the field. With the recent play of sophomore quarterback Clayton Thorson, that will be entirely possible. In the first three games of the season, Thorson has averaged 6.9 yards per attempt — not overwhelming by any standard but enough to get the job done. He spread the ball around beautifully, completing passes to eight different receivers, and has the deep ball working. It would be a shock if Thorson can’t move the Cats down the field against Nebraska. Furthermore, NU currently has the second-best punter in the Big Ten in Hunter Niswander. Pinning the Cornhuskers within their own 20 repeatedly will be key to a Wildcat win. 3. Will Hunter Niswander punt like it’s the Western Michigan game…or the Duke game? Gelman (half-full): I am all in on the Niswander for Heisman campaign. After finishing 2015 with the most punts in the Big Ten but the lowest average yards, Niswander has vastly improved his game so far this year. NU and Nebraska always manage to play close games, and Niswander’s punting could play a huge role if this game turns into a battle of field position. Against Western Michigan, Niswander averaged 51 yards per punt, easily the highest of his career. All he has to do to continue that progress is get a nice stretch before the game, and he should be golden. Balk (half-empty): Max has taken to tweeting #Heiswander after punts from the junior punter. And, at least so far, it hasn’t been good luck. After kicking the leather off the ball on each of his three punts Week 1, Niswander has come back to earth. Against Duke he managed a respectable but unspectacular 42.9 yards per punt and lofted two into the end zone for touchbacks. Which is not all that surprising, because Niswander appears to have developed into a respectable but unspectacular punter. That’s still good news for NU, which has struggled in the punting game in the past; Niswander will likely have to punt plenty this week. But it’s more likely he’ll be solid than Ray Guy worthy. Last year’s Northwestern offense was undeniably punchless, something that needed to change coming into 2016. In particular, big plays in the passing game were particularly hard to come by last season. The Wildcats’ offense, led by then-first-year quarterback starter Clayton Thorson, rarely put together explosive plays through the air. Coach Pat Fitzgerald has mentioned in multiple press conferences this season that taking more shots downfield is a big part of the team’s plan in 2016. It took a few weeks for that vision to materialize, but Saturday’s game against Duke might have marked the arrival of the big-play passing attack Fitzgerald is looking for. NU had just 12 pass plays go for 25 yards or more last season. It had five such plays against Duke, including all three of the Cats’ touchdowns. A lot of pieces need to come together to make a big play happen. The offensive line needs to hold the pocket together long enough for the play to develop, the receiver on the other end needs to get open and the quarterback needs to throw the ball accurately and on-time down the field. Too often last season, one of those components failed, but on NU’s first touchdown of the night against the Blue Devils, everything went according to plan. The Cats’ offensive line, much maligned following the loss to Illinois State, keeps a clean pocket for Thorson (No. 18) on the play. Junior superback Garrett Dickerson (No. 9) uses a nice burst to get open in the seam, and Thorson hits on the throw for a 26-yard score. Duke frequently sent blitzers from all over the field to get after Thorson, leaving its secondary stretched thin on some plays. Last season, against heavy pressure, Thorson rarely looked to make the defense pay downfield. But on this play, he stands tall in the pocket and delivers a 44-yard strike with a free rusher bearing down on him. Junior wideout Solomon Vault (No. 4) is on the receiving end of this touchdown after beating the Blue Devils’ coverage over the top. The kick return specialist adds a speed element on the outside that NU was missing last season, and on this play he demonstrates his potential as a vertical threat taking the top off the defense. Sometimes, a good design for the defense you face can manufacture a big play, like on the Cats’ final touchdown play in the fourth quarter. Duke brought the house, rushing seven men and leaving only four back in coverage. NU counters by running crossing routes with senior receiver Austin Carr (No. 80) and sophomore receiver Flynn Nagel (No. 2) from the slot at the top of the screen, hoping to confuse the few defenders left to cover on the play and create an opening. The Blue Devils oblige, as two defenders move towards Nagel, leaving Carr wide open for an easy 58-yard touchdown. These plays demonstrate a big-play ability through the air that was simply lacking last season. For a few plays Saturday night, the offensive line held up just long enough. Receivers, either through personal talent or smart play design, got open. 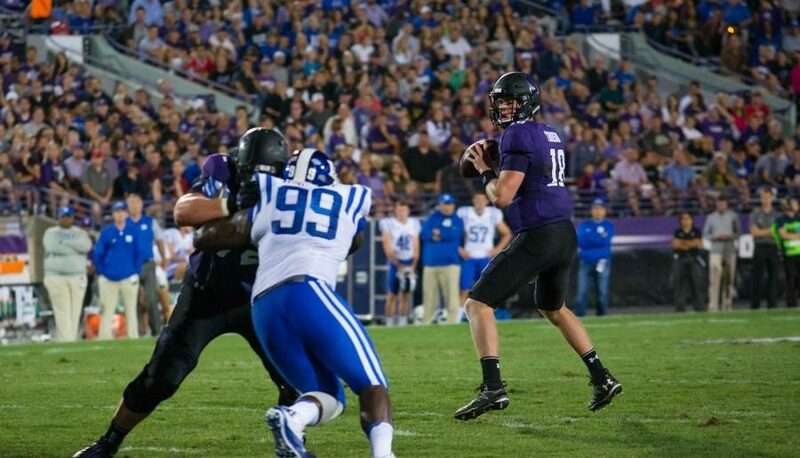 And Thorson embraced Duke’s pressure and stood tall to make throws down the field. The passing offense wasn’t perfect by any means, and neither was Thorson, who went just 18-for-39 and threw two picks on the night. But hitting on big plays gives the Cats a margin for error they didn’t have a year ago, and with the defense appearing to be rounding into form, that might be enough to surprise the rest of the way. Northwestern’s kick return unit electrified fans in 2015, with then-sophomore Solomon Vault taking two kicks to the house in two especially high-leverage moments. But the Wildcats punt return unit failed to offer any kind of balance. The combination of then-freshman Flynn Nagel and then-senior Miles Shuler ran back just 13 punts all year, ranking 10th out of 14 teams in the Big Ten. All too often NU’s punt returners wouldn’t even field the ball, letting it bounce for a few extra yards instead calling for a fair catch. Nagel changed that Saturday against Duke by running back five punts, the most in a game for the Cats over at least the past nine seasons. He didn’t bust a long one, but Nagel’s returns were consistently positive. That he was trying to return them at all was a welcome sight to many fans. Nagel has clearly taken that to heart, and his assertiveness in fielding punts Saturday brought back memories of NU’s best punt returner in recent memory: Venric Mark. A dynamic running back in his own right, Mark truly shined when he dropped back deep to field a punt. After his junior season in 2012, Mark received first-team All-America honors as a return specialist thanks to the two punts he returned for scores that year. When Mark got ready to field a punt, everybody in the stadium held their breath in anticipation. Nagel has yet to bust a long return and doesn’t inspire the same kind of fear, but that he tries at least offers some hope. That aggressiveness, Fitzgerald said, is key to being a “dude” — somebody like Mark who can make defenders miss and turn nothing into something on a punt return. Nagel obviously isn’t at that level yet, but Fitzgerald seems encouraged by the early returns. Four of the last five meetings between Northwestern (1-2) and No. 20 Nebraska (3-0) have been decided by three points or less, including a 30-28 triumph by the Wildcats on the road last year. But the Cornhusker team that NU will face in this year’s Big Ten-opening game is significantly more experienced and confident than the one that struggled mightily in close games en route to a 6-7 season in 2015. Almost all of Nebraska’s offensive weapons — including quarterback Tommy Armstrong Jr., running backs Devine Ozigbo and Terrell Newby and receiver Jordan Westerkamp — are back this season and helped the Cornhuskers upset then-No. 22 Oregon 35-32 last week to vault to No. 20 in the national rankings. The “Big Red” will ride that momentum into Evanston this Saturday in the two Big Ten West foes’ conference opener. Nebraska’s biggest strength: Dual-threat quarterback Armstrong has been dangerous both on the ground and through the air throughout his career. Armstrong threw for over 3,000 yards and 22 touchdowns and added an additional 529 yards (excluding sacks) and seven touchdowns rushing in 2015, after posting similar stats in 2014. He threw it 48 times against the Cats but completed only half of those attempts for 291 yards. Now entering his third and final season at the helm for Nebraska, Armstrong has been much more mistake-free in his passing — he’s thrown only one interception in three games after 16 last year — and had one of the best rushing games of his career against Oregon with 95 yards. Armstrong is complemented by a pair of excellent receivers: longtime No. 1 wideout Westerkamp and emerging deep threat Alonzo Moore (26.4 yards per catch so far). Nebraska’s biggest weakness: The pass rush struggled to generate pressure and the secondary showed holes in 2015, giving opposing quarterbacks the time to find open receivers and opposing receivers the time to get downfield. That equated to the 121st-ranked pass defense (out of 127 teams) and 60 opponent completions of 20 or more yards, the fourth-most allowed in the nation. Those major issues have yet to show themselves so far this season, but Oregon tried to pass just 23 times against them — the Cornhuskers’ coverage hasn’t been tested much. Only one defensive lineman, end Ross Dzuris, has recorded a sack, and the rest of the line has been largely quiet on the stat sheet. The secondary also lost two of its four starters from a year ago. Nebraska’s biggest question: Can the Cornhuskers stay focused after upsetting Oregon? Nebraska coach Mike Riley said at his team’s press conference Monday that it would be the last time he would talk about the Oregon game, and Westerkamp said he was confident he and his teammates would be able to focus solely forward on Northwestern. But the Cornhuskers haven’t picked up a win as big as Saturday’s triumph over the Ducks in years, and a matchup against the 1-2 Cats might not inspire the same intensity. 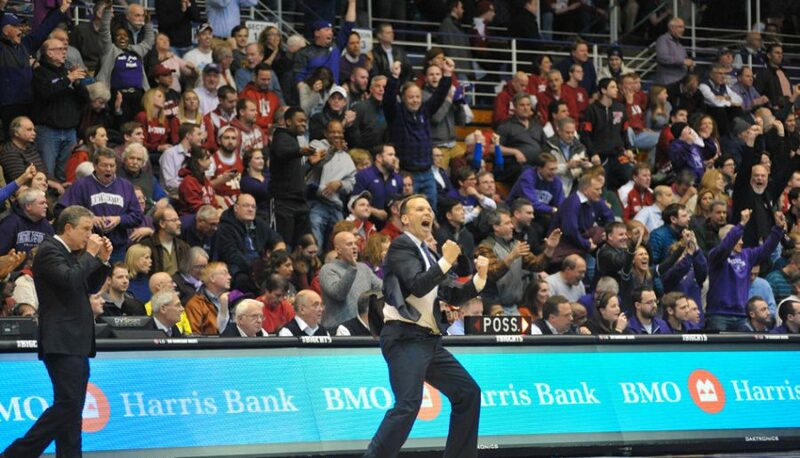 Nebraska lost at home to NU last year the week after a big 23-point road win over Minnesota. Football writers Max Gelman, Bobby Pillote and Tim Balk discuss Northwestern’s win over Duke and the Wildcats’ increased focus on a heavy passing attack. Click below to listen.